The Tsingy in Tsingy National Park of Bemaraha, Madagascar represent not only a rock formation endemic to Madagascar but also one of few rock forests found around the world. The Tsingy represent a maze of multi-tiered gray limestone finely carved by tropical acid rain into sharp pointy tops. Their sides resembling machined corduroy. Erosive acid rain rivers have carved canyons through these rocks to create a maze of rock one can walk, climb or crawl through. They are so unique to Madagascar that the Malagasy words for tiptoe are “Me Tsingy Tsingy” for how the locals would have to walk through these areas (on their toes). It is also one of the most expensive places in Madagascar, hard to get to and well worth the visit. I really had no idea what to expect exiting my bus in Miandrivazo under growing rain. Aside from the onslaught of “push-push” bicycle taxis looking for a faire that is. Somehow, in our effort to negotiate our trip of the Tsiribihina River directly with a boatman, we were funneled and joined by an ever increasing entourage of people (growing to over a dozen) looking for a commission and directing us like a magnet towards the Mayer’s office. Here we were back to negotiating down from an expensive package trip. 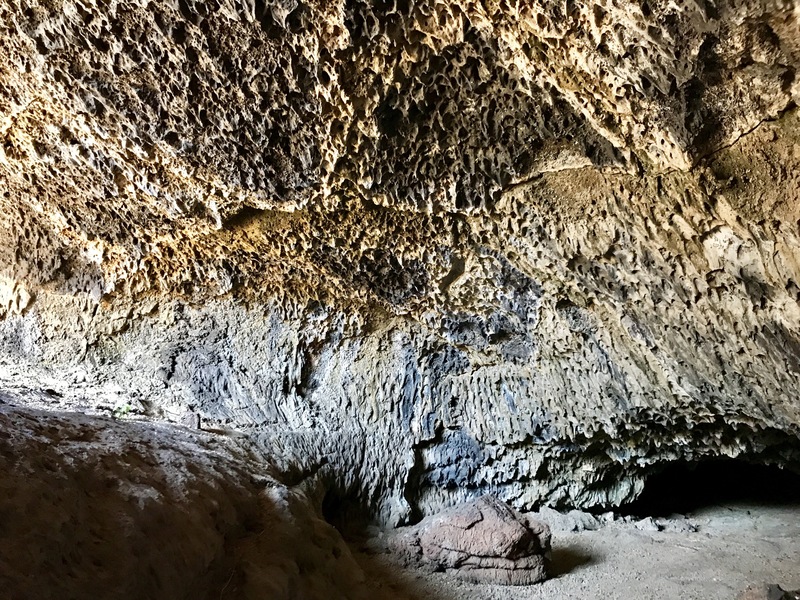 Self Guided Lava Tube Caving at Lava Beds Nat. Mon. After reading the sign marking Golden Dome I walk down an asphalt trail one hundred feet until I reach my destination: a steel ladder protruding out of a 3 ft wide opening in the ground. Looking down into the hole, there is nothing but darkness outside the small bit of visible rock floor illuminated by the entrance sunlight. Spry Canyon (3B III) feels like an off-trail slab approach and then starts as a wide forested canyon typical of Zion. However, it’s charm are the multiple narrow, dark and wicked cool slot canyons, each a couple hundred feet long. These slots contain sometimes unavoidable pools of water (even in October), however there are typically alternate rappel options to avoid those sections of the canyon to keep dry if you look around before rappelling in. Super cool canyon, I think I liked it more than Behunin. The sky is just lightening with a touch of pink as we dropped off at the top of The Narrows, one of the best hikes in the world. It is cold, in the upper thirties so I’m wearing a light base layer, fleece and waterproof shell over wetsuit. After walking a couple miles on road, past a dilapidated cabin. 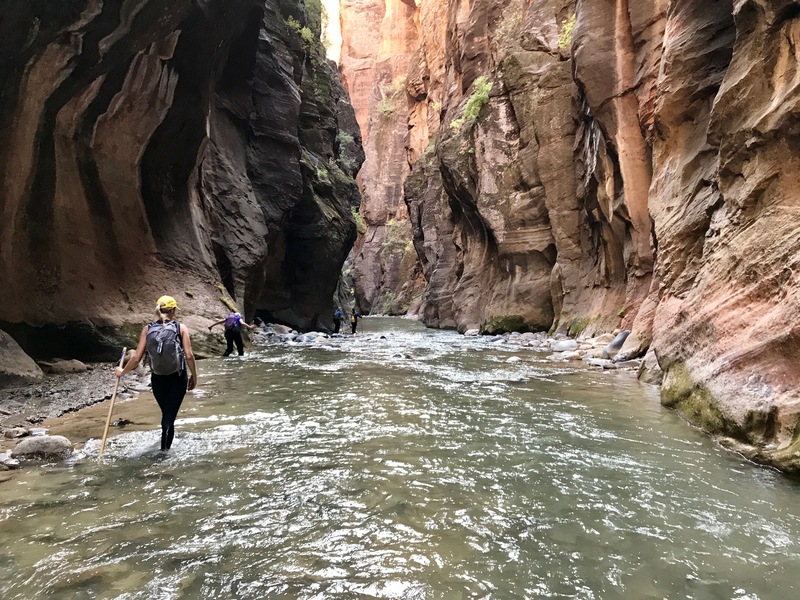 were started by bounced across the rocks across the Virgin River in a dance to keep our feet dry. 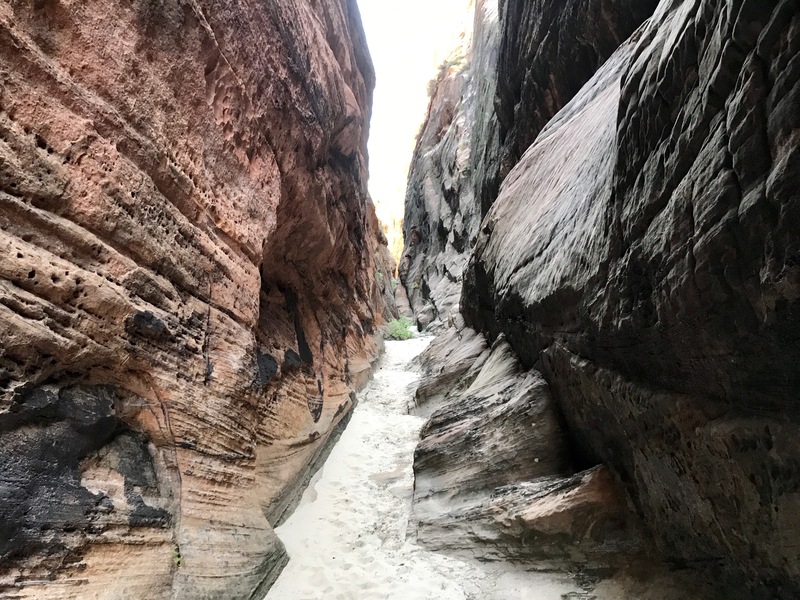 Behunin Canyon (3A/B III) was a very straightforward canyon with two fun, longer rappel sections and two slot canyon rappels. In those sloty parts there were small pools in early October but that added to the fun by bridging around them. Overall, the canyon offers a variety of sandstone, a long hike and an easy, straightforward day. Also, about half the rappels could be downclimbed instead of you wanted. 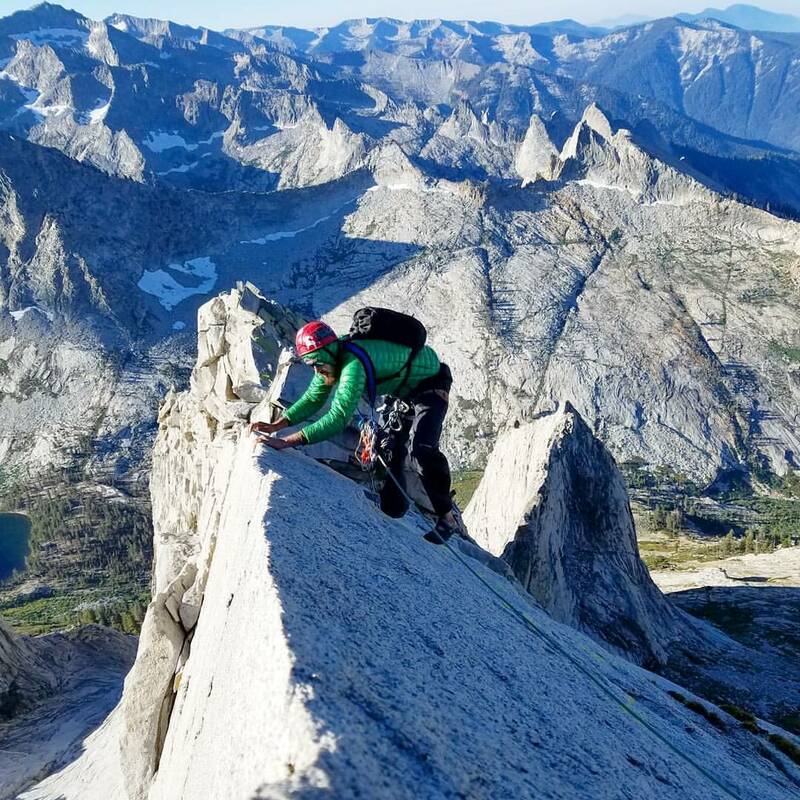 Leaning hard into my harness I positioned my feet firmly and nearly perpendicularly against the blank gray, white and black speckled wall as I began my full sprint towards a granite ledge. Not quite reaching it I pendulum back in the other direction, pulled by gravity and directed by the rope clipped 30ft above me to a bolt. 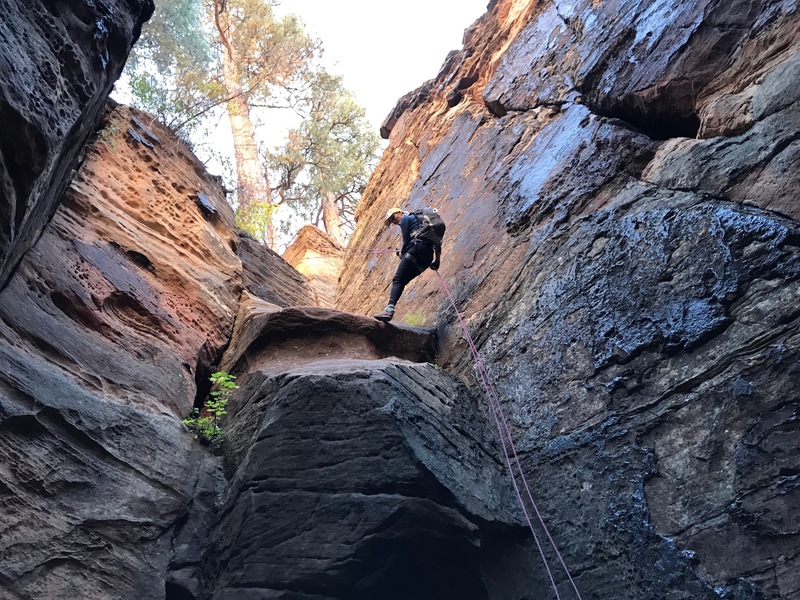 I embrace the new direction, pumping my legs and jumping over my lead line to gain as much elevation and speed as possible in the opposite direction before I turn back towards the ledge for another attempt. The pendulum occurs and I again thrust forward with as much force as possible. My legs feel like I am futilely attempting to push a car up a hill as I try to gain inches of height towards the end of the pendulum. I desperately reach forward with my hands for the ledge lip only to come up inches short of being yanked downward and away. Tired and breathing heavily, I let the pendulum bring me to a rest several bolts from the start of the bolt ladder. It all started one day when I happened upon this description, “longer, more sustained, more exposed Matthes Crest”. 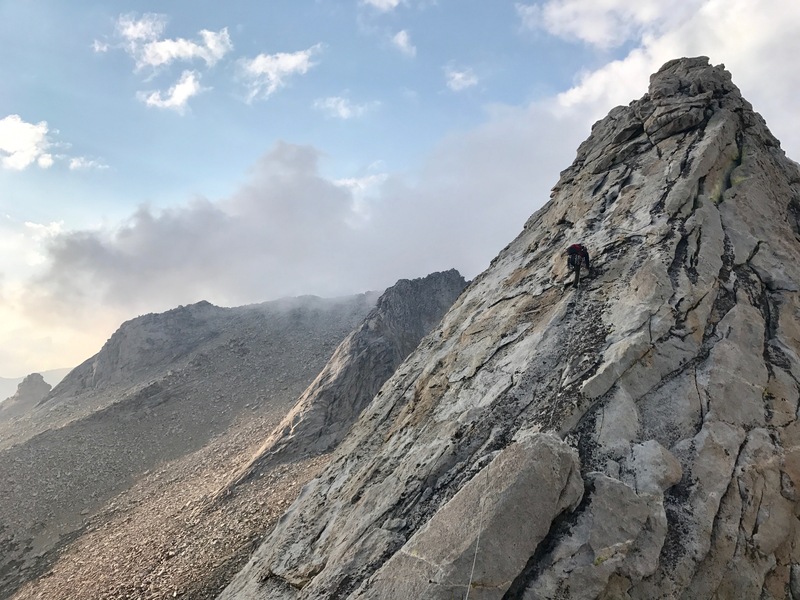 Wow, Matthes Crest is THE favorite climb for many people and I just stumbled upon a similar route that could be its superior! The lacking description, amazing photos, wilderness setting and few ascents for Saber Ridge only added to the allure of the adventure. 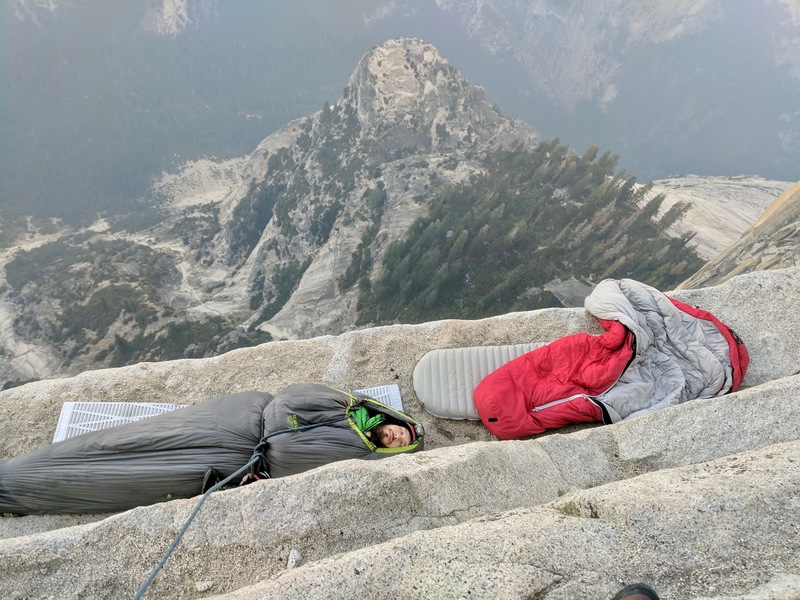 What I would find was the most sustained exposure since Mt Sir Donald on a wild backcountry route so committing and long that it took an unexpected overnight ledge bivy to finish. Note: I provide a detailed, technical description of the climb in another post, while providing a general description below to keep the story moving. On September 7th, 2017 I climbed Saber Ridge not knowing much about it. My initial thoughts were that it would be several sustained pitches of 5.7+ to gain the ridge and then a 3-4th class cruise along the ridgeline. I was surprised to find after the headwall most of the ridge continues to gain about 700 ft of elevation and remains in the 5.5-5.7 with most sections runout with poor pro selection and high exposure. Too much for me to consider simul-climbing it as the gear is questionable and the rock quality not feeling bomber enough for no-fall climbing. Upon completion, it took me ~16 hrs to climb, an overnight bivy and a 4 hrs descent. The whole trip is a great story that I talk about in another post, but here I hope to outline the technical attributes of the climb for other rock climbers. 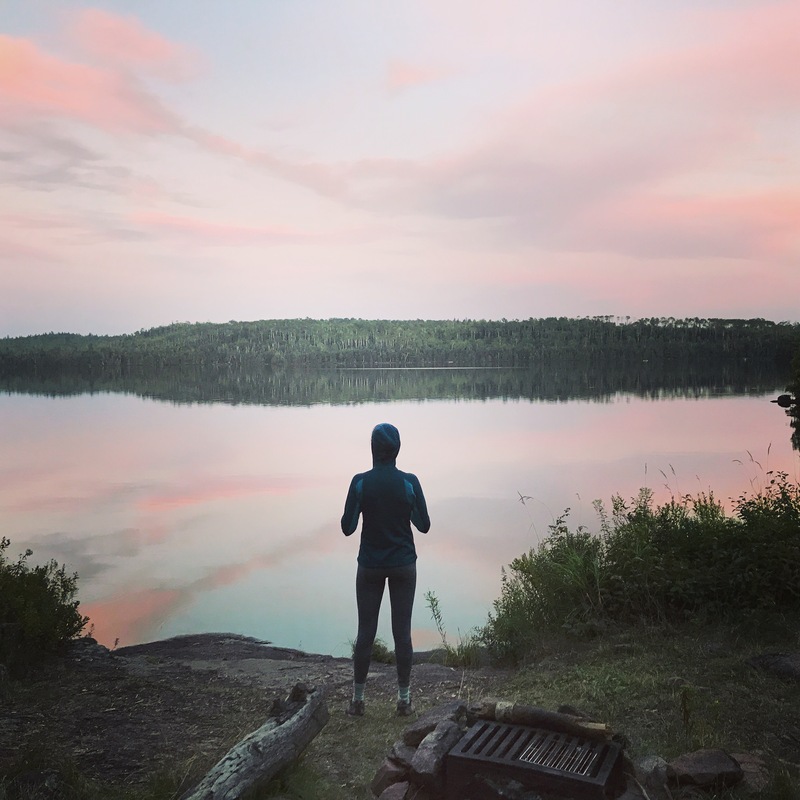 Let me take you to a place where there are more fish than people, where every campsite has a lakeside view and a swarm of mosquitos takes on a whole new meaning. The Boundary Waters Canoe Area Wilderness (BWCAW) is located in the most Northern reaches of Minnesota. Where regulations restrict motorized boats, there are no roads and the basic luxuries of a campsite latrine and fire ring provide primitive access while protecting the pristine environment. The regulations go so far as to allow no more than four canoes and nine people to gather at any time. This is wilderness.